PHOTOGRILL: Why did you make the photo of the exorcist? 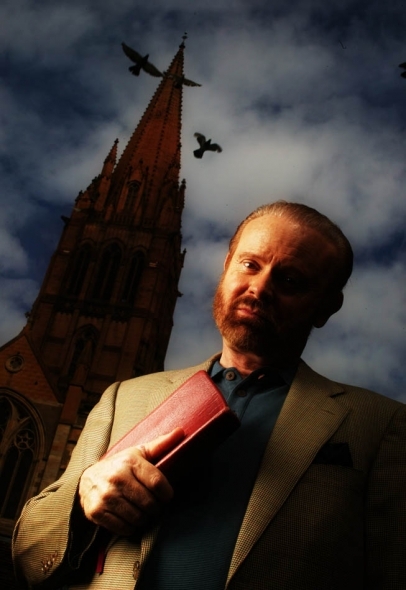 PHOTOGRAPHER: I photographed Bob Larsen for Metro a section in the Age in 2005, he was the Exorcist that had a run in with John Saffran on his popular ABC TV series ‘John Saffran Vs. God’. The footage Saffron shot with Larsen was pretty disturbing. I asked Saffran (we did a photo shoot for A2 a few weeks before) about the ‘possession’ he had apparently experienced on the show and he assured me he hadn’t been hamming it up and that he had no idea what had happened that night. PHOTOGRILL: How were you planning to photograph him? PHOTOGRAPHER: With some trepidation I set off to meet the Exorcist at The Westin Hotel in Melbourne. Hotel rooms are probably the worst place you can do a photo shoot in. So I took him to the City Square to could use St Paul’s Cathedral as a suitable ‘gothic’ backdrop. I asked him to bring his bible and I set up a Norman flash unit with a soft box. Norman flash units are portable studio type flash heads with large battery packs for use on location when power isn’t available. Soft boxes or grids etc can be attached to the heads. These days I use a set of Elinchrom Quadra Rangers which are highly portable and come with wireless remotes so you don’t have to mess with synch cables. I use small Manfrotto light stands that attach together for easy carrying. It was the middle of the day and I wanted to do the ‘day for night’ effect where you light up the subject and underexpose the background by several f stops. Exorcists don’t look very spooky in the middle of the day and I wanted him outside, so I controlled the light by turning the flash unit to high power, used a low ISO and closed my aperture right down for a more atmospheric result. PHOTOGRILL: How How did the photo shoot go? Anyway I wasn’t about to let the ‘dark forces’ beat me so I used some modern day magic, Adobe Photoshop, to make a composite of the the adjoining frames and voila. 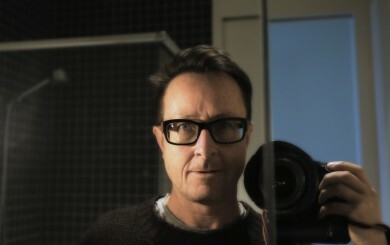 PHOTOGRILL: So are you an artist or story telling press photographer? PHOTOGRAPHER: I think most press photographers these days are a combination of artist and story teller. If I’d just shot the Exorcist sitting on a seat in his hotel room it would have been rather dull so you try to get a little creative by choosing locations and lighting techniques and hopefully a bit of luck to make the shot more dynamic and tell the story you want to tell. Sometimes you can get pretty abstract with what you shoot but you still have to tell a story. Perhaps an example of this is a shot of mine that was published recently with a story on bad weather. I photographed a kids’ sandpit filled up with water. It’s kind of abstract but it tells a story in a different way rather than just photographing people running with umbrellas, like you’ve seen a hundred times. This entry was posted on Tuesday, August 23rd, 2011 at 3:46 pm. 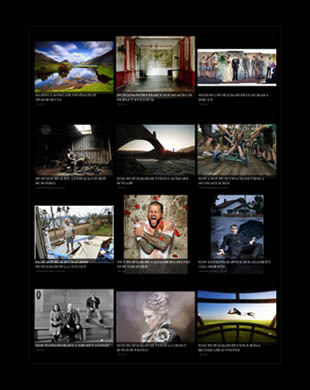 It is filed under Fairfax Photographers, The Grill and tagged with Creative Photography, Lighting, People, Photographic Techniques, Portraiture. You can follow any responses to this entry through the RSS 2.0 feed.